That story illustrates everything that’s important about where Shepherd is now. When he first came to public attention in 2005, after winning the Fine Music Radio composer’s award, he was 17, an introspective and often self-effacing teenager. What then seemed the predictable career path – university studies, time as a sideman, then as a leader, and so on – turned out more surprising. Dissatisfied with the lack of South African and contemporary focus in his UCT music curriculum, he quit, instead seeking mentorship from saxophonist Zim Ngqawana, which he says instilled “a sense of craftsmanship and hard work, and of music as a way of life and spirituality”. By 2009 he’d already released his first solo album, fineART. Now 27, he’s been this year’s Standard Bank Young Artist for jazz, has four albums out (and a fifth solo outing on the way), and has established an international touring career and collaborations that will take him to the Tokyo Jazz Festival in September and New York’s Carnegie Hall in October. 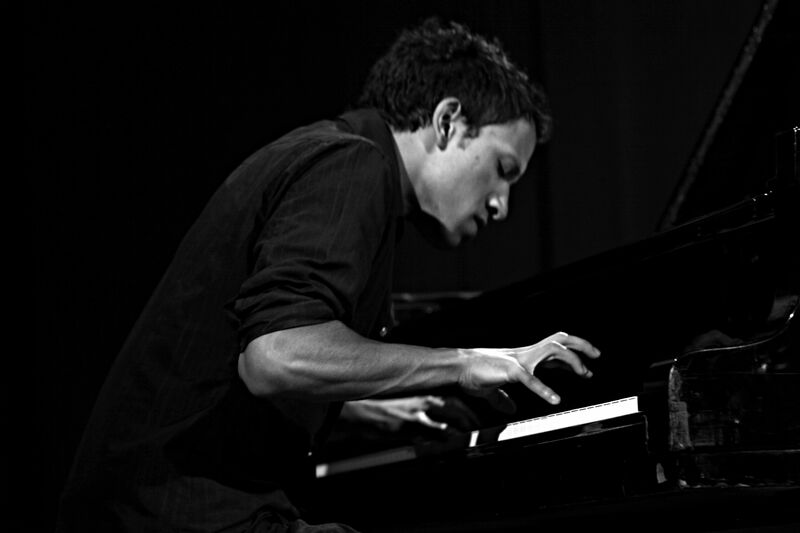 Over the years his playing has grown enormously in command and physicality, and composing is now a central focus. Alongside this, he has expanded a consistent vision about the politics of his music – not just its explicit messages, but how politics are enacted in the relationships between players, as well as between musicians and the industry. ‘Politics’, though, is my term; what Shepherd talks about is where power lies, and how it can be democratised. Shepherd uses the word “texture” a lot when talking about his music, and he’s finding contexts beyond the conventional jazz group which offer different ways of exploring that. In Xamissa, the 2013 commission for the Paris Autumn Festival, he was working with a percussion set including goema drums, piano, a mouth bow and four voices, “and in my mind, I envisioned it as an even larger sound”. The singers all had an operatic background, “but they were from Gugulethu, and had worked in the charismatic church vocal tradition. I tried to break barriers and take the voices back to the singing style nonprofessional singers in this country use, which I find extremely moving,” he says. One reason Shepherd can now focus on composition is that he understands far more about how the music industry works. He developed that reassuring savvy through solid teamwork during a decade with manager Theo Lawrence. “Theo and I grew together. It was a working partnership where we developed a joint vision for music and the environment where it would be performed. We still spend a lot of time talking about how we’ll arrange things, in South Africa and overseas – and that gets you respect from organisers and promoters,” Shepherd has found. That’s where the pianist’s restless discontent reappears. Some of the improvised business tactics of his early years – such as organising gigs in schools, churches and living rooms – look with hindsight like precisely the right strategy for another goal: taking music “to the places where it hasn’t been heard, where there is often a fresh openness in audiences”. He still does it: Mark Fransman, Mombelli and Ganesh Geymeier performed in his living room earlier this month. But Shepherd wishes it wasn’t so necessary. “We need a better circuit for live performance. I like to think a university circuit could work; they have performance spaces, instruments and the core of an interested audience in places where you wouldn’t otherwise find them. We need more festivals – not more mega-events, but little specialist festivals like some I saw in small towns when I toured,” he says. Shepherd, though, is at a place where he’s happy to deal with sometimes tough domestic conditions because of the buzz he gets from his music. Part of that is down to the trio (and regular guest, peerless reedman Buddy Wells). “I’m now at a point where I’m totally happy just to play with these guys,” he says. “The amount of effort and enthusiasm they put in is incredible – no composer could ask for more. There’s still new material to create and I want to see where it goes, and where we all go with it.” After the stage experience of Xamissa, and before that the Afrikaapse production in Cape Town, he will also soon be working with Cooper on a film score – “an interest in exploring sound textures is practically a requirement there”.